Size: 48″X27″X65″ (L XBX H)in inches approx. 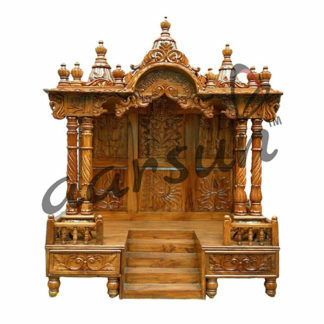 Aarsun Woods brings to you Handcrafted Design Home Temple Mandir made beautifully made by skilled artisans in premium quality Teak Wood (Sagwan / Sevan Wood). Temple / Mandir is a vital part of your home and instills a spiritual touch and positive vibes to the place. This Traditional Wooden Temple consists of 3 parts. At the Top, 3 domes are placed , the center one being larger than the adjacent two. The Domes are made in ethnic Gopuram style with minimal carving. Matching to the Dome is the outer Mehraab with floral pattern. The Center / Garbgriha consists of 2 pillars in front each side with elephant carved at the base. Side and front is guarded by railings. At the front, steps have been provided. At the base, two pull out drawers have been provided adjacent to the steps in front. the drawers spans the depth of the Temple and are large enough to keep all your Pooja essentials such as Dhoop / Incense Sticks. The unit is dispatched in a fixed manner and no assembly is required. The unit is a made to order design and can be customized as per your requirement. Please give us a call at +91-8192999135 or whatsapp us on the same number for more details. We are the manufacturers and have an experience of over 25 years in manufacturing Wooden Furniture and Handicrafts. Manufacturing Time for this Temple is 25-30 days. We provide Insured Surface Shipping on all our products. Feel free to contact us in case you need a different size or design. Please note that the unit is made of premium teak wood except for the base and the ceiling which is made in Teak Plywood.